If you aren't following me on instagram then you may not know what I was up to over the weekend. 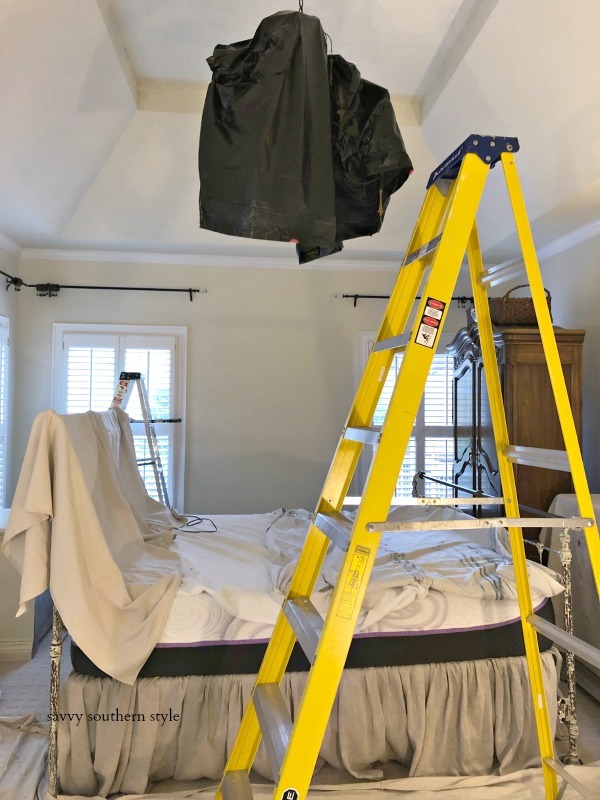 I have been wanting to lighten up the master bedroom for quite some time, but knew the job was going to be a big one. When I was younger painting a room didn't bother me, but this sixty-three years young body doesn't have the stamina it once did. If I want something like this done though I just have to get started and then there's no looking back. The best thing is having a partner willing to help because I could not have done this without him. 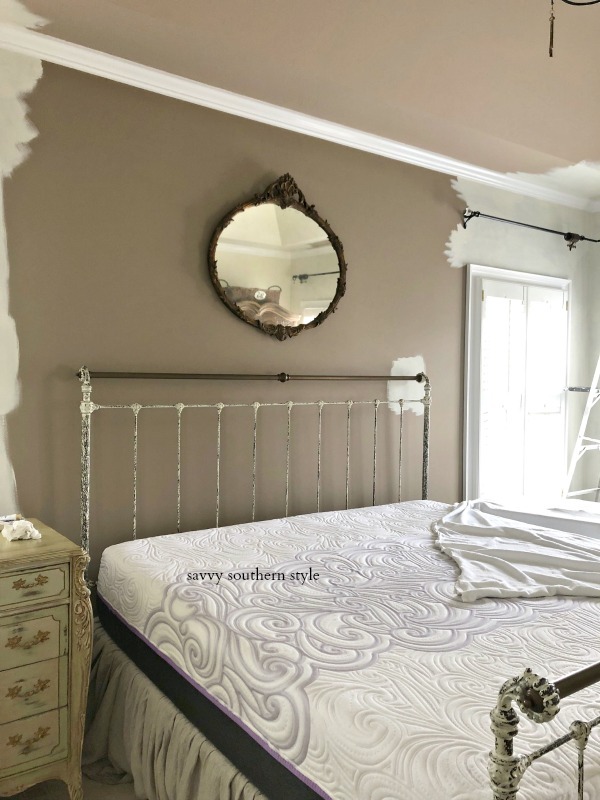 I never mentioned painting the room until he came home last Thursday night and I had paint swatches painted in several spots in the room trying to decide on what color. 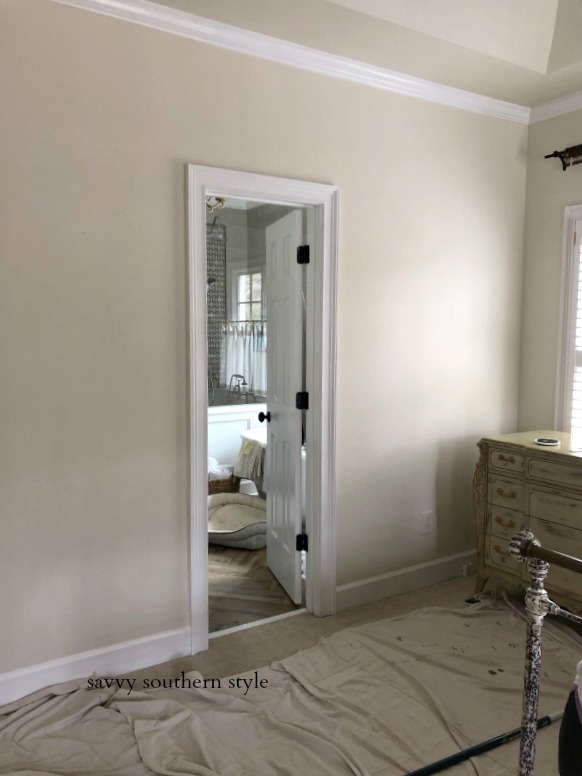 The next day I decided to use a color we already have in much of the house....French Canvas by Benjamin Moore and it turned out fabulous. I will reveal the room in it's new color later, but for now I'm sharing some phone shots of our weekend project. I can't believe the last time I shared this room was last fall. It was always so hard to get decent photos because of the dark walls and lack of light even with four windows. 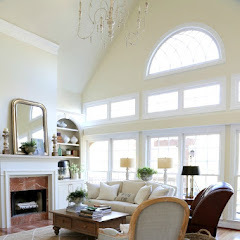 My most asked question has always been what color are the walls in here and it was Alexandria Beige by Benjamin Moore. I loved the darker moodier walls, but my taste has changed and I want lighter and brighter now. This shot shows the true color where my camera shots always looked a bit off. 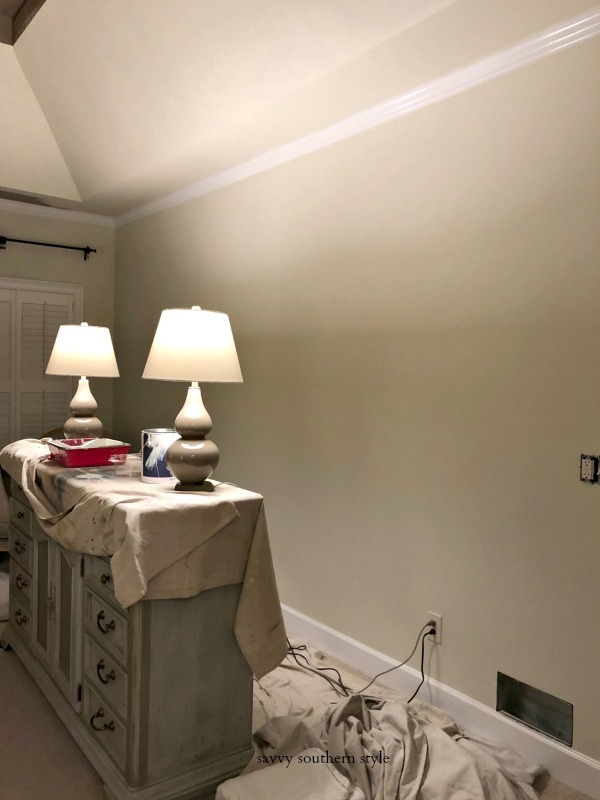 We painted this long wall first so we could move the furniture to this wall in order to paint the rest. We have huge pieces of furniture to move around and furniture sliders make the job much easier. We started painting around three o'clock Friday afternoon and finished on Sunday afternoon. Funny how the job explodes to all the surrounding rooms. Bailey's dog bed was tossed in the bathroom. And it looked like a bomb went off in the great room. We both painted the walls and the mister took on the high ceiling even with his bad shoulders. I painted all the trim and I found muscles I forgot existed. There is only one more room that I would like a color change in, but it will have to wait and it will probably be hired out. 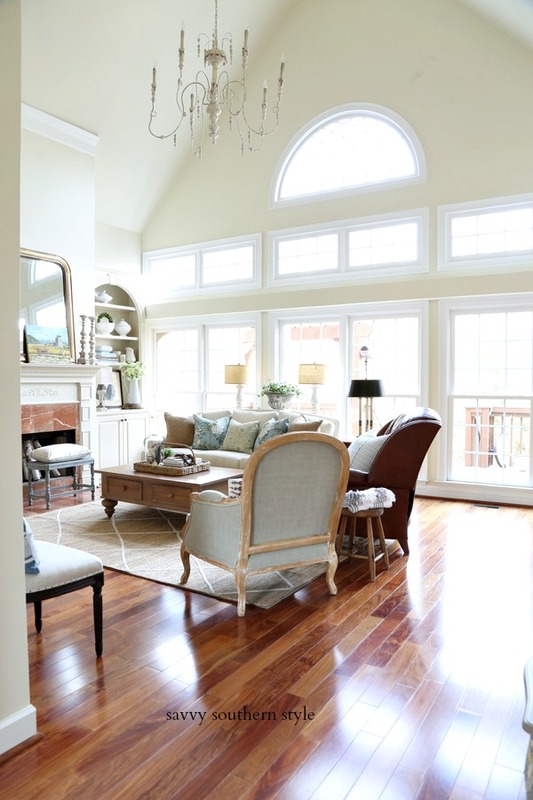 We just don't have it in us to tackle tall ceilings again. It's sunny here all week for once in a very long time! It looks great and I love the color. You do have really high ceilings to contend with. I use to love to paint and I feel like you now. It is a lot of work and the ole muscles scream to let you know you should not be doing this anymore!!!! Have a great week. Looks great and Miss Bailey looks less than thrilled. I looked twice did you mention the new color? In truly my younger days, I would wallpaper and paint trim. I even did a light popcorn on the living room ceiling, and was even complimented by a painter one time. Though, like so many other things, once you do some of these things, they don't happen again. 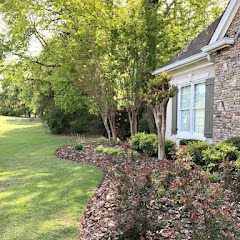 Hubby doesn't like to paint, and I don't either so we have some painting to be done now, and I have a painter in waiting for when I decide on colors and dates......nevertheless, for what we can see, the transformation is going to be gorgeous I'm sure. Love the color, so pretty. It looks great. You two are very ambitious and not afraid to tackle a big project! Hope My Savvy’s shoulders are OK and you are recuperating! It’s going to look fabulous! It looks so pretty and bright. Great color. 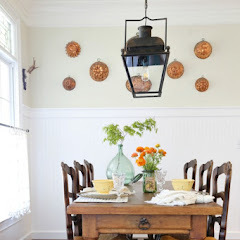 I have one wall in my kitchen that I need to paint and have put if off all winter. I think I need to get to it. Is looks fantastic! I'm gearing up to do my master in a few months. I have to do my high ceilings as well. Any tips for painting the high ceilings? 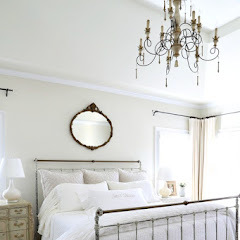 I always loved the color of your bedroom, but I also love the lighter brighter look. One thing I didn't realize is that you have a gorgeous tray ceiling. so beautiful! Glad the two of you could be a team on this, it really is such hard work and takes two people. great job you two! That is going to be gorgeous with the lighter color, Kim. It was pretty before, too, but I, like you, have a tendency to go to lighter colors now than I did a few years ago. 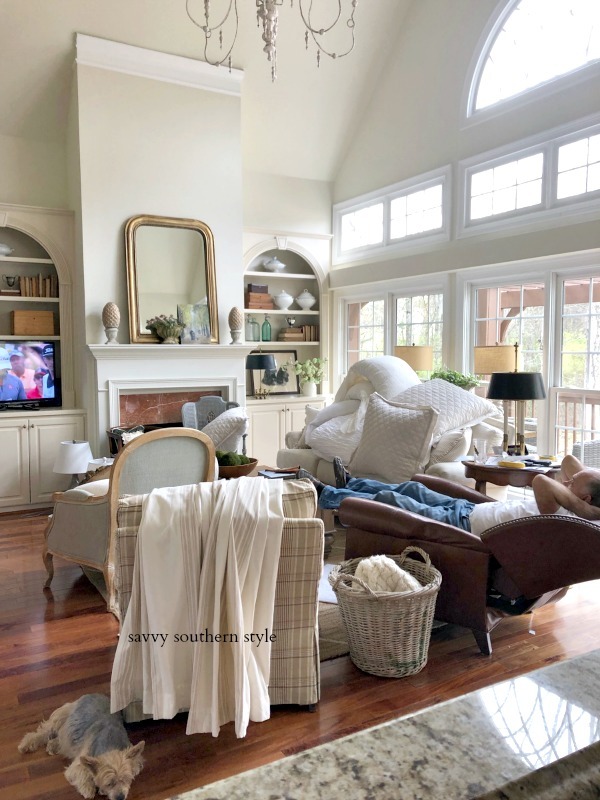 Those are high ceilings to paint and good for your hubby for tackling that project!!! I really like it. I wasn't on practically any social media this weekend as we had Colleen all weekend. I can't wait to see it all put together. I hope you and Mr. Savvy are feeling OK! I have been debating what color to do our master, it still hasn't been done!! Have a great week! 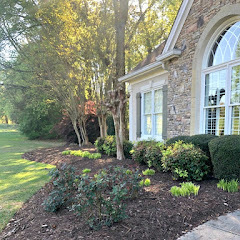 I have always been in awe of your stamina over the years to update your house by doing much of the work yourself, with Mr. Savvy's help. 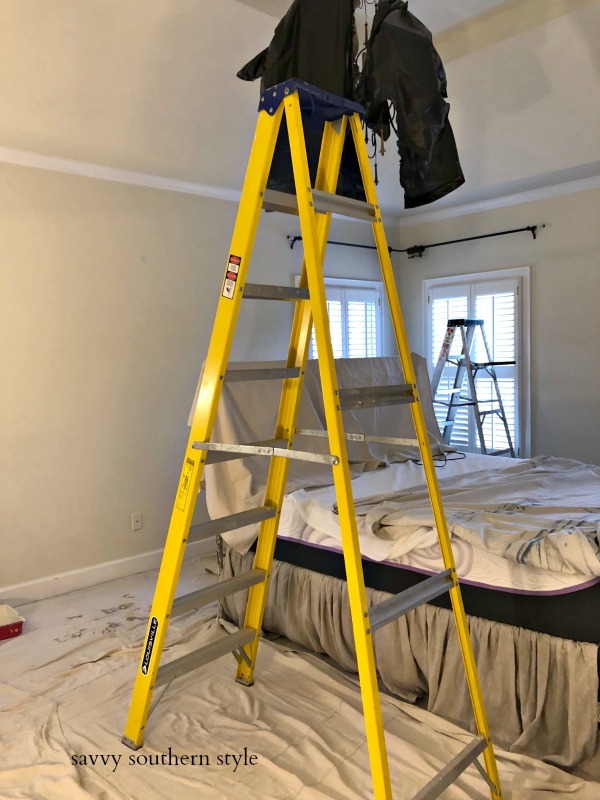 Your new paint in the bedroom looks wonderful. well aren't you ambitious! :) now go sit down and take care of those sore muscles. Oh Kim, it is beautiful. I love this room. Will you post a picture of it all put together with your bed and curtains and so forth? I love this. Kim, it looks great! I used to love to paint, but it is too hard now! Can't wait to see it all put together!! Kim I'm 75 and just got done painting my bedroom by myself!!! Don't let the husbs paint in the house he's too messy!! Here's the thing if you don't use it you lose it so I try to use it!!!! It looks great! There’s no way we could have tackled the tray ceiling. I am with you. My 65 year old body doesn't like painting that much anymore! Looking forward to seeing the reveal! 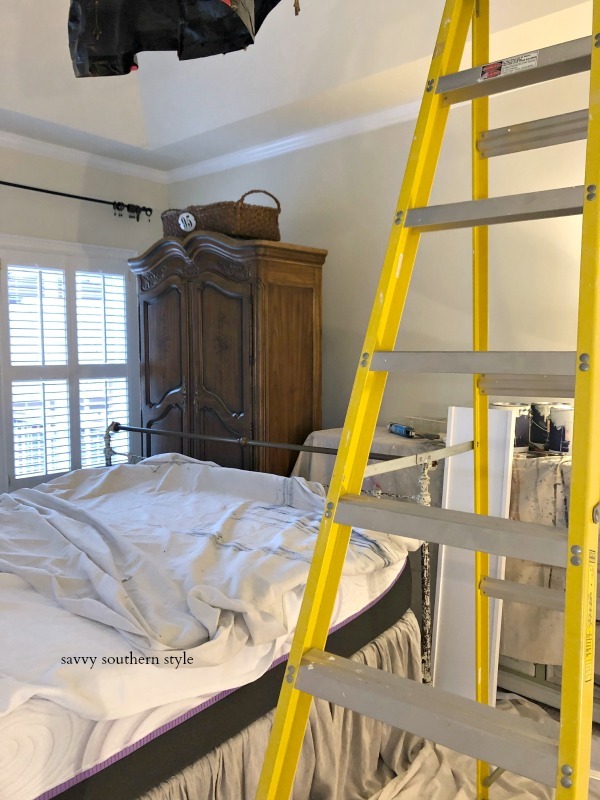 I think the actual painting of a room isn't so bad...it's all the furniture moving, taping off, dropcloth arranging, and then putting everything back afterward that is soooo exhausting! And of course painting a ceiling is no piece of cake. But, there's nothing that transforms a space so inexpensively as a paint change. Congratulations on a job well done. 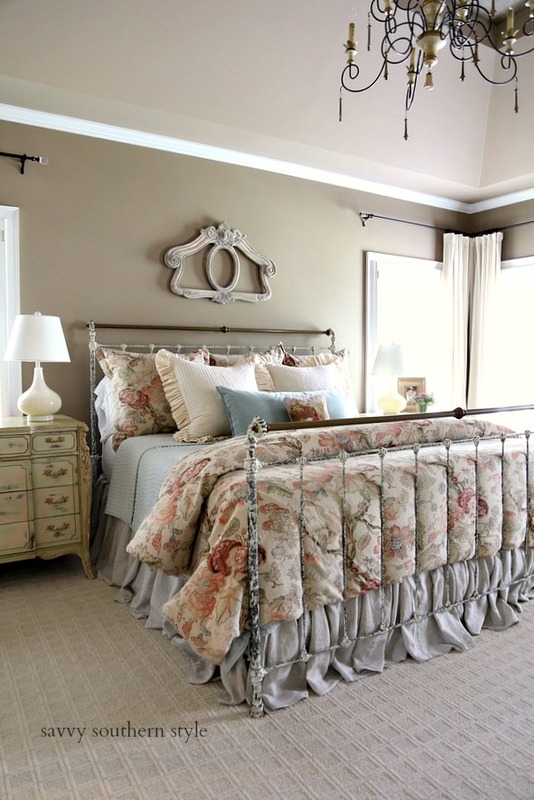 I love the French Canvas in your home and tried out a sample in my upstairs. Nor so great. It looked green, albeit a light grey green. I was disappointed but think I will be going with Simply White. Can't wait to see the finished product. Oh, it’s going to be beautiful! 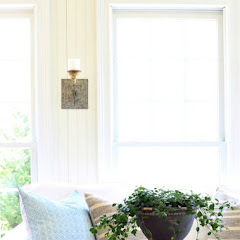 I have a darker color in a few rooms but am slowly lightening up!